This week we made our annual trip to West Wales staying in our usual pink cottage which has a wonderful view out to sea. 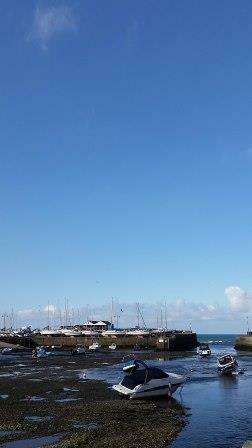 And, we have been so lucky with the weather which means we have been out and about on our favourite coastal paths. 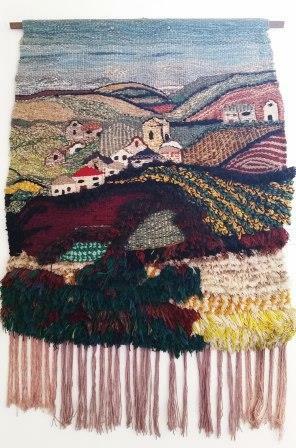 I have also been lucky enough to revisit many favourite art and crafty places on our travels. 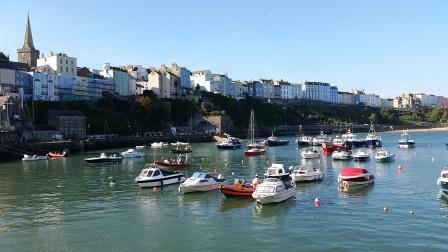 We set off on Saturday morning in glorious sunshine, stopping off on the way at Tenby. It is a good few years since we visited and we were not disappointed. Next stop Narbeth which is great for shopping and then on to Solva where we met up with Alistair who joined us for a couple of days. It was lovely to see him and great to be able to reintroduce him to the area. It is a long time since he last visited. The first day we walked to St David’s and then walked back again – it must have been getting on for 10 miles at least! Refuelled in the evening with fish and chips at the Shed in Porthgain. So yummy that we made a return visit later in the week! The second day we drove to Newgale and walked back to Solva. A quick lunch and then a trip to Solva Woollen Mill which is always enjoyable. We enjoyed dinner at a St David’s Kitchen, a new restaurant that has opened in St David’s. 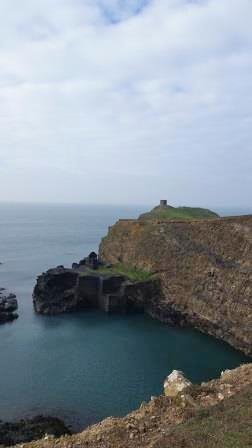 Tuesday Alistair left and we headed to Porthgain for one of my favourite walks – from Porthgain to Abereiddy and the Blue Lagoon, which was very busy with orienteers jumping into the sea from the ruins. Interesting to see that Porthgain has a little stall now selling fresh fish and crab. We would have supported had we not already put in an order for crab and lobster with the local fisherman in Solva. On the way back we stopped at Trefin as it had an art and craft fair advertised. It is a small village that seems to have a vibrant art and craft society which was evident from the variety of goodies on sale. 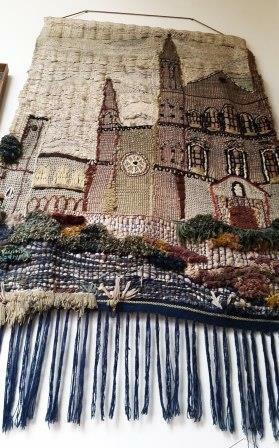 Lovely to be able to support keen crafters and enjoy some beautiful wall hangings on display in the village hall. We finished our outing with a visit to Melin Tregwynt Woollen Mill for tea and cake and a browse around the shop. Just couldn’t resisit buying some wool offcuts for crafting projects. Wednesday we had a meeting in Aberystwyth so set off early so that we could stop off at various places on the way. First was the flour mill at St Dogmaels to stock up on flour and oats. Shame we couldn’t make Tuesday as the village has a vibrant Farmers market. Next, we stopped in Cardigan. I always enjoy a stop here to visit the trimmings stall on the market. Great range of goodies and very reasonable prices. There is also a good craft stall selling Christmas card embellishments and card. A stop in Cardigan always includes a stop at the Custom House where we have picked up some lovely pieces over the years. This year was no exception as we bought a lovely slate vase and pondered over a coffee table and reading lamp which would look lovely in our newly decorated lounge! Another highlight of the Cardigan trip was finding a new bakehouse cafe next to the Custom House. An old building which has been sensitively renovated. We made a quick stop in Aberareon in the hope that we would pick up some fish for tea but we were disappointed as the fish shop was closed! On the plus side it was a beautiful sunny day so we took a walk by the harbour and browsed around the tourist information which sells some beautiful Welsh crafts. Our last stop on our way back to Solva was at Annie Washbrook’s fabric barn near Nevern. It is on the A487 through Felindre Farchog, and is completely hidden away behind a lovely stone cottage. It took me ages to find it the first time I visited and on this occasion I found that it is in flux as the business is being moved to a unit in Newport – a challenge for next year if I manage to fit in a visit! 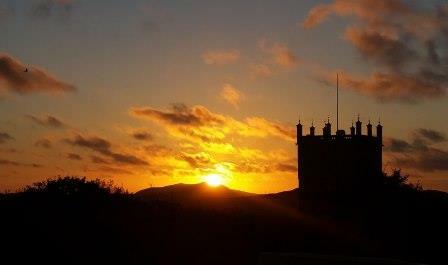 Last treat before returning to the cottage was a wonderful sunset over St David’s cathedral. 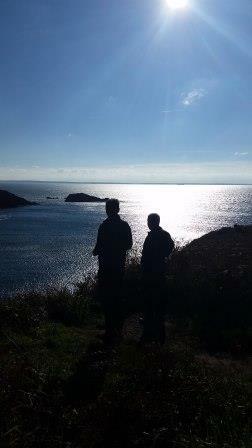 Thursday was another gloriously sunny day spent walking from Porthclais to St Justinian in the morning and a trip to Haverfordwest in the afternoon for a meeting. 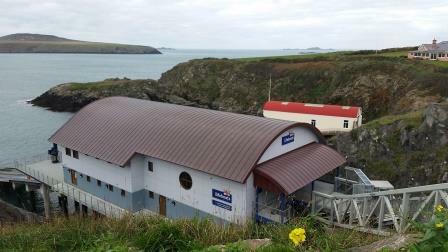 The new St Justinian lifeboat station is finally finished and looks very smart…. and, it has been in action already. The first callout from the new station came on 24 October when people in a kayak experienced difficulties. 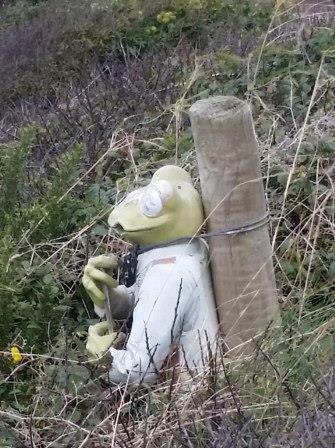 The coastal path has been diverted slightly around the new station but the jazz playing frog, which has stood there for a number of years, continues to stand proud scanning the ocean! Friday morning was blissful. Sunshine and a wonderful blue sky with a balmy temperature to match. We drove into St David’s early and visited the Goats Gallery, a must in my view. I love Amanda Wright’s work and her husband’s ceramics. 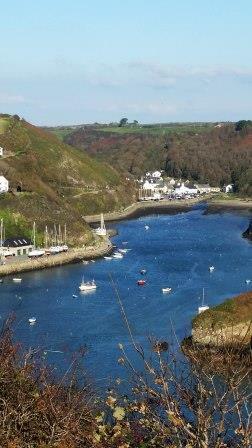 We then enjoyed a walk in the sunshine back to Solva and I spent the afternoon sewing. Saturday was cloudy but dry and balmy. Time for a last walk. We set off from Tregwynt Woollen Mill and walked along the coastal path. Hundreds of birds circulating and making ready to migrate for the winter – a wonderful sight! A last scoot around the shops to pick up a few gifts for Christmas and then we headed back to relax before enjoying dinner at the Cwtch in St Davids – a firm favourite not to be missed! And, finally before travelling home on Sunday we stopped at Something Fishy to buy some freshly cooked goodies to take home – yummy! As always, we had a lovely time and have booked for next year already!